This week saw the Guide Dogs charity launch a campaign called #cycleyes — as in ‘Cycle Eyes’ not ‘Cycle? Yes!’ — although the latter is what they spelled, albeit with different punctuation! Unfortunately, it wasn’t the best of launches – a flawed survey’s results were highlighted and led to later retractions. The charity also missed the mark in what the underlying cause of conflict is: poor infrastructure; and how best to put that right: pressing governments to create space for cycling. It is a good thing to also remind people that not all of us have good vision, hearing or mobility. There is an increasing responsibility on each of us as our chosen vehicle grows*1 in size, weight and speed: more care must be taken to look out for each other on our inadequate road network. However, some cannot look – they are blind – and so the onus is on the rest of us to take even greater care. Tweet sent by Guide Dogs London on 26 June 2014. The creation of ‘space for cycling‘, as promoted by grassroots volunteers, cycle groups, the London Cycling Campaign and the CTC, the national cycling charity, would go a long way to reducing the conflict on our roads – including between people that are walking with guide dogs and people cycling. It would be great to see the Guide Dogs charity help with putting pressure on our local and national governments to create segregated space for cycling – away from motor vehicles and from people walking. and the main carriageway for faster vehicles. More enlightened countries, such as The Netherlands, do this already and they see it benefiting people that face more challenges than most of us: Who else benefits from the Dutch cycling infrastructure? Unfortunately, the Guide Dogs campaign was not launched well, and lead to the charity having to retract statements they had made. Just hours after the launch, that became the story more than the good points that they were trying to get across. The charity created a survey and asked on Facebook and Twitter for certain people to respond to it – a classic self-selection survey but also one targeted to just those who had strong opinions on the matter. The charity promoted the results which they claimed showed that a large percentage of people with guide dogs had experienced a crash or near miss with a person riding a bicycle. Worrying if true; and even more reason for the charity to push the government to create a safer road network. 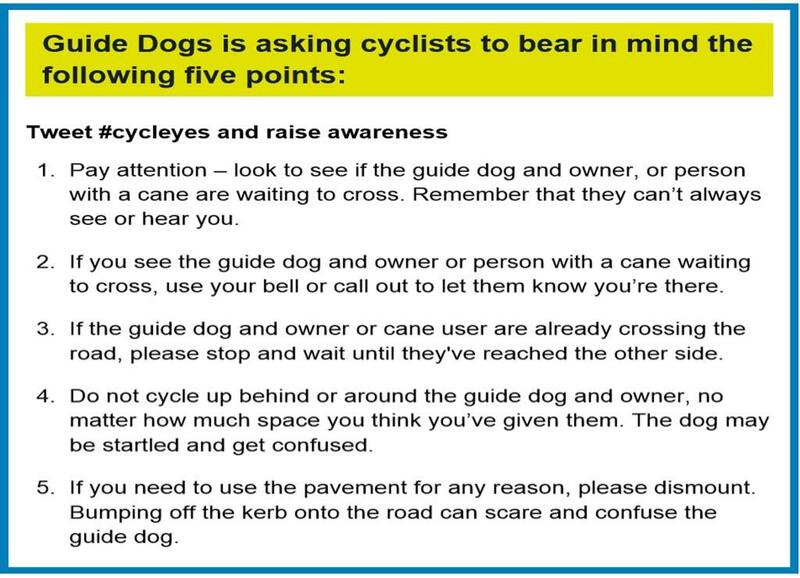 The 5 points that the Guide Dogs charity want you to bear in mind when you choose to cycle. If these claims were backed up by evidence, then I and many other road danger reduction campaigners had missed a very serious issue that clearly had gone unreported both in the media and in campaign circles up to now. I asked the charity for the evidence behind the headline: the survey’s questions and the answers given. We will not be sharing the results of the survey, other than the headline statistics. The survey questions indicate that the answers may reveal helpful evidence about the issues faced by blind people – case studies, if you will. That evidence could be used by road danger reduction campaigners to lobby for better road networks to reduce conflict. The #cycleyes campaign at the Guide Dogs website was updated with an apology. Correction: An earlier version of this story said a quarter of guide dogs working in London had been hit by a bike. The Guide Dogs for the Blind Association has since said the information it provided was incorrect. These results come from a short ‘Survey Monkey’ form completed by 33 of the 320 guide dog owners in London. The charity initially did have that information on its campaign page, but I could no longer find it. A video that the charity released also was taken down (marked ‘private’). The video showed a street scene in London with people at a pedestrian crossing, including someone with a guide dog. It asked if you could hear the people on bicycles. The screen faded to black and you could hear street sounds – mainly motor cars and trucks passing by. 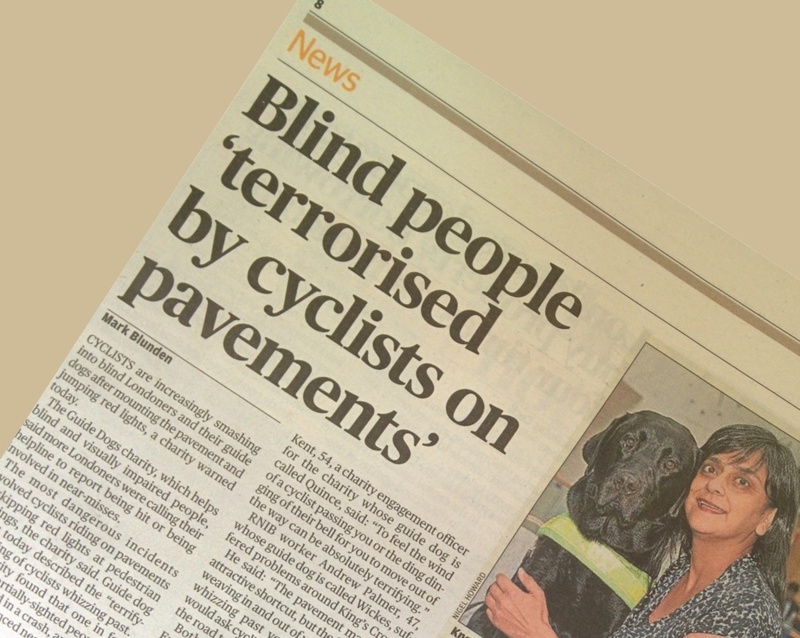 I thought it did get across the point of view of a blind or partially blind person; although clearly it was heavily biased towards making out that the only danger faced by people with guide dogs were people cycling on the pavement and going through red lights at crossings. Others have now dug into the limited details about the survey – including the surprise that out of the millions of people in London that there are just 320 guide dog owners. Perhaps they’d [Guide Dogs] polled a significant sample of London’s 41,000 blind and partially sighted people to find out what problems they had getting around, and been told by a large number that cyclists were an issue. Not so. The one in four figure comes from a self-selected online survey and represents just 14 people claiming they or their dogs had been hit by cyclists. The BBC radio programme ‘More or Less‘ which looks into dubious claims, reported on Friday about the flawed survey. We’ve been looking into this and actually the story gets stranger and stranger… So it’s [the survey] not even close to being a representative sample of visually impaired people and we cannot extrapolate from the survey results. In the end, the poor fellow at Guide Dogs admitted he wasn’t great with numbers – and we’re not going to disagree with him on that. We apologise if we have offended any cyclists during this campaign launch. A small number of cyclists have voiced their concerns over the size of the survey. Our survey was primarily to obtain case studies for our campaign and gather some specific stories from those who have been hit or had a near miss from a cyclist. We have always clearly stated that we know the vast majority of cyclists are responsible. This campaign reaches out to them to encourage the whole cycling community all road users in London to look out for blind and partially sighted pedestrians. Clearly, it is more than just a small number of cyclists voicing their concerns! The survey and how it was handled by the charity both at the launch and in the controversy that erupted afterwards can be a lesson to other charities and organisations that rely on survey results to get media attention. In short: be sure of your facts, your math and your statements. The charity also appeared blind to the underlying root cause of the conflict: the need for governments to fix the road network to reduce the times when its members and people walking, cycling and driving come into contact. Their statements and subsequent reaction is especially disappointing given the many sponsored cycle rides the charity promotes. I do hope the Guide Dogs charity will release the answers – as case studies – from its survey so that a stronger case can be made to governments for space for cycling. Working together on this would be a great outcome from the flawed campaign launch. (click to see larger picture). 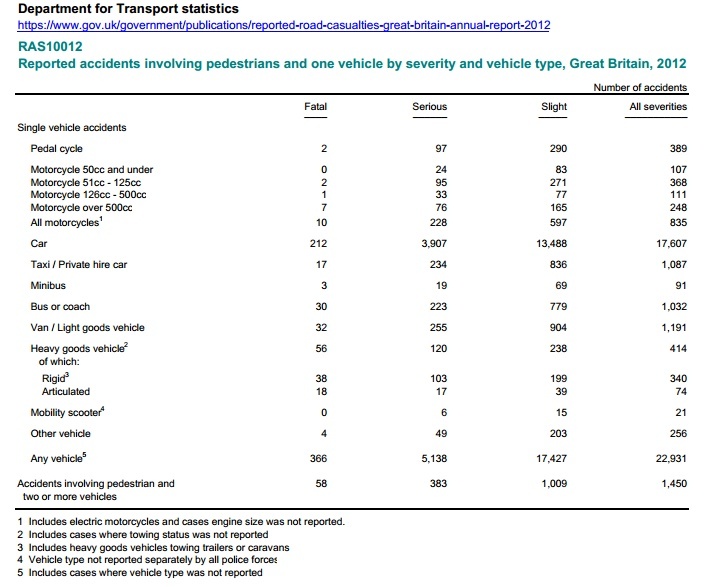 The 2012 statistics showing number of crashes involving a pedestrian by severity and vehicle type (including bicycles). From page 81 of the DfT 2012 Reported Road Casualties Report. You don’t generally do too much damage walking into things or other people (thankfully rare); cycling into someone else can be more dangerous (but again is rare); driving into someone is most dangerous of all (and sadly isn’t rare). As weight and speed go up so do the forces acting on the other person – simple physics; plus, the bigger the vehicle, the more there is of it that can hit someone else. Statistics about the number of crashes involving a pedestrian can be found in the Department for Transport Road Casualities Report 2012 (latest available). Look especially at the row showing number of collisions involving a pedal cycle (389) and car (17,607). 31 August 2014: Comments on the issues.